This aphid-like insect is native to the eastern U.S. but does not pose a serious problem to Virginia vineyards. There are two forms of this insect, one on the roots (radicicola) and the other on the foliage (gallicola). Root forms are more damaging than foliar forms, but they rarely occur in the eastern U.S. Wild vines (V. riparia) are highly susceptible to foliar forms. Seyval and Villard Blanc are also highly susceptible. The foliar form overwinters as eggs on canes. Eggs hatch when the leaves have emerged in the spring. Nymphs move to upper leaf surfaces and begin feeding. Their feeding induces the formation of galls on the leaves (Fig. 2). After about 15 days, the adult stage is reached within the galls. Young are produced parthenogenetically (no males present) and 6-7 generations occur on the leaves. Crawlers (Plate 4) will move from older leaves to leaves at shoot tips. Occasionally, ome individuals may drop to the ground and move to the roots. In the fall, females lay from 3-8 eggs that result in insects of both sexes, including winged forms. These mate, and females lay a single egg that overwinters. In the root form, phylloxera overwinter on the surfaces of root galls. When roots start growing in the spring, these asexual insects lay eggs and produce several generations. 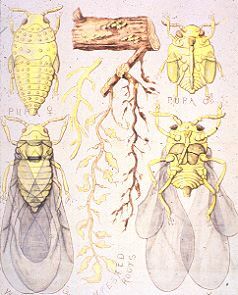 Fungal infection in roots are more severe in the presence of phylloxera. This pest illustrates one of the classic cases of host plant resistance. Native American grape rootstocks are resistant to the grape phylloxera, while European varieties are susceptible. When the insect was introduced into Europe in about 1860, the French wine industry was nearly destroyed. However, the vines were saved by grafting them onto imported American rootstocks. Resistant rootstocks are still important in preventing damage by the grape phylloxera. Nymphal establishment and adult reproductive rates are lower on resistant rootstocks than on susceptible types. 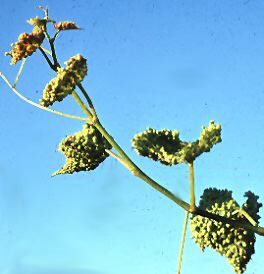 In the early 1980's, a biotype appeared in California with the ability to colonize some resistant rootstocks. Research in that state has been performed on remote sensing of phylloxera infestations. See additional phylloxera comments, and sampling vineyards from California, and Oregon photo. See a student report on grape phylloxera prepared for "Arthropod Management in Fruit Crops". Granett, J, M. A. Walker, & L. Kocsis. 2001. Biology and management of grape phylloxera. Annu. Rev. Entomol. 46: 387-412.